Lladro Porcelain Figurine, Couple of Doves. Two doves kissing. Size: 4.75" x 7.5". Makes a great Anniversary, Birthday, Valentine's Day or Wedding Gift. Also makes a beautiful cake topper for a wedding cake. Doves have long been a symbol for both peace and love. 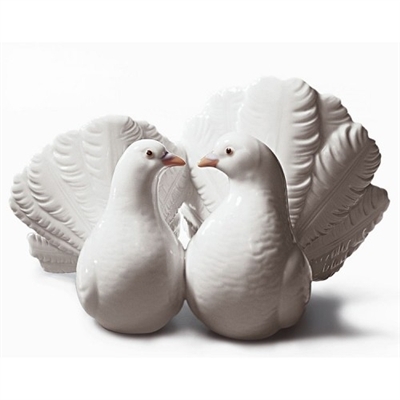 These two Lladro doves make a beautiful wedding gift as a wish for peace and love for the happy couple.